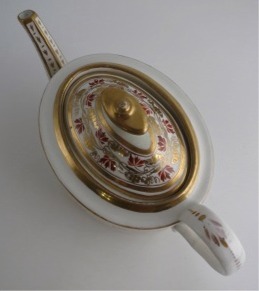 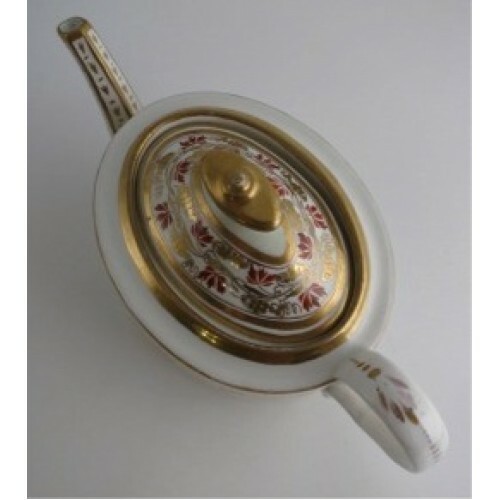 A most attractive smooth straight sided oval teapot from the famous Coalport factory of John Rose, c1805. 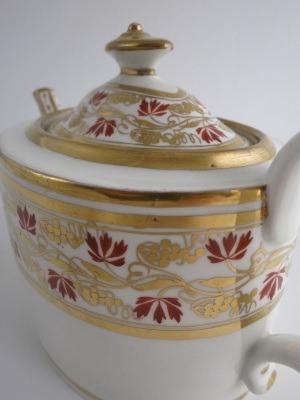 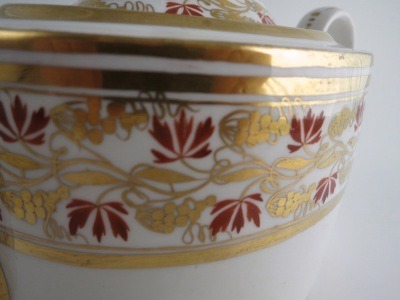 The teapot is beautifully decorated by hand with wide bands of orange and gilded grape vine decoration. 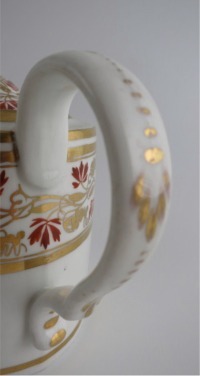 The body of the teapot is an oval shape with smooth vertical sides. 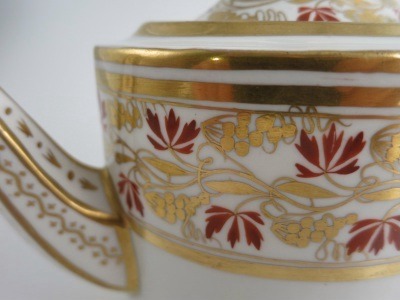 The delightful decoration comprises two very wide bands of orange and gilded grape vine decoration, the grape bunches are in gilt, as are the vine and tendrils, the vine leaves are in orange enamel. 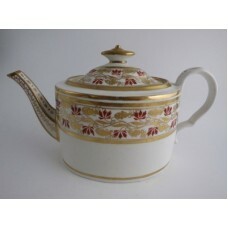 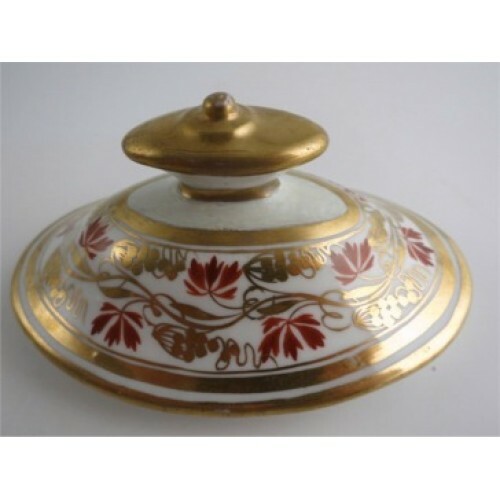 This giving a most attractive and striking decoration. 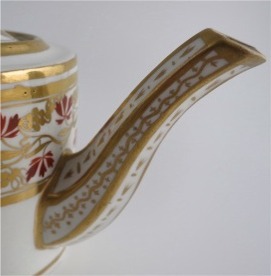 All the gilding on the teapot is of a very high quality in a shining rich honey colour. 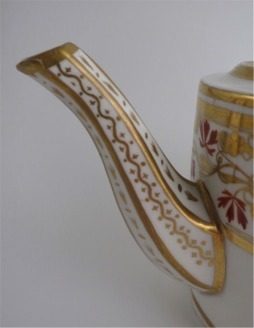 The spout of the teapot is of an elegant faceted moulded form, the ridge of each facet is gilded and there is a gilt decoration on each facet. 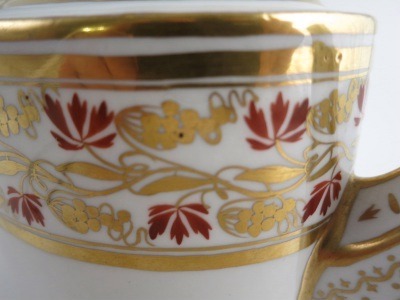 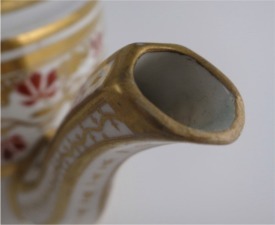 The tip of the spout is also gilded. 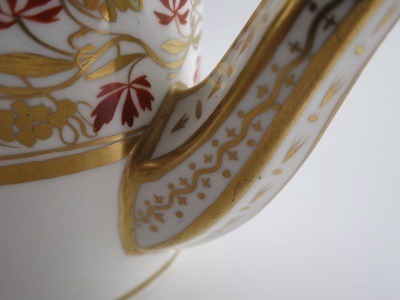 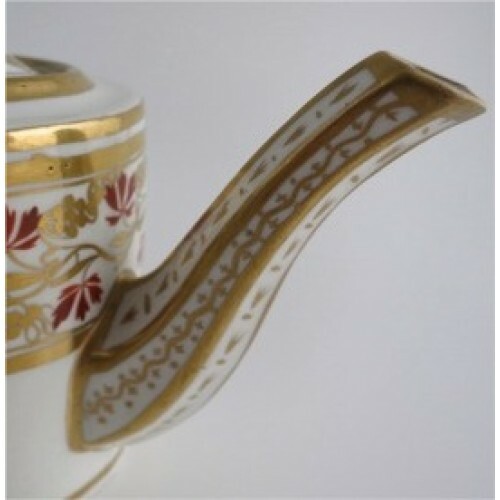 The handle of the teapot is of an ear shaped open loop and has applied gilt foliate decoration applied to the back edge. 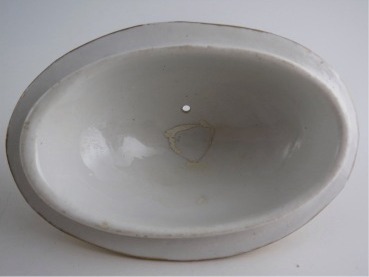 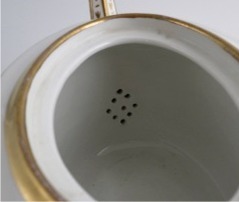 The smooth domed oval lid of the teapot fits into a recess in the teapot. 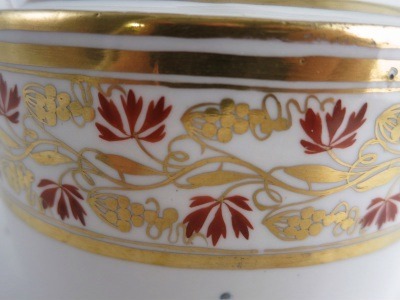 It has the same beautiful 'grape vine' decoration applied to it. 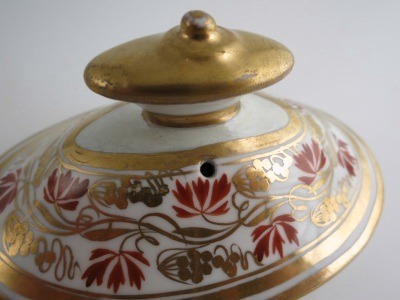 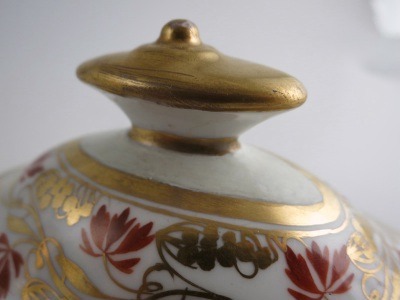 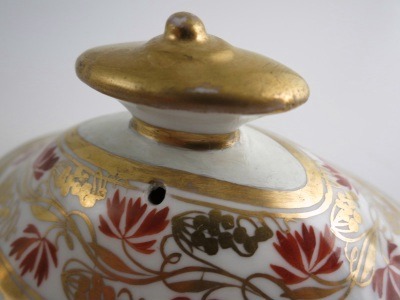 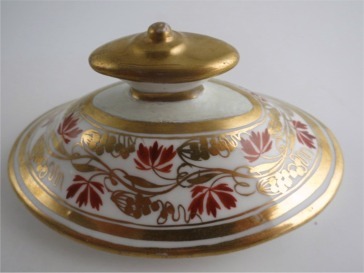 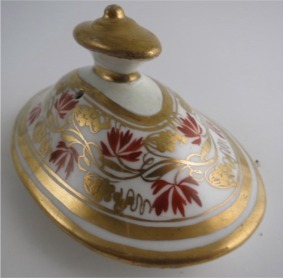 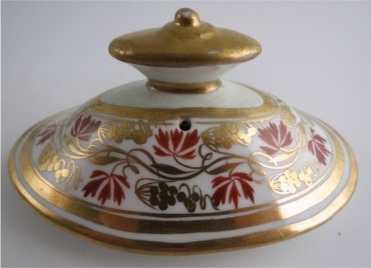 There is a smooth oval finial to the lid, the top portion of which is gilded. 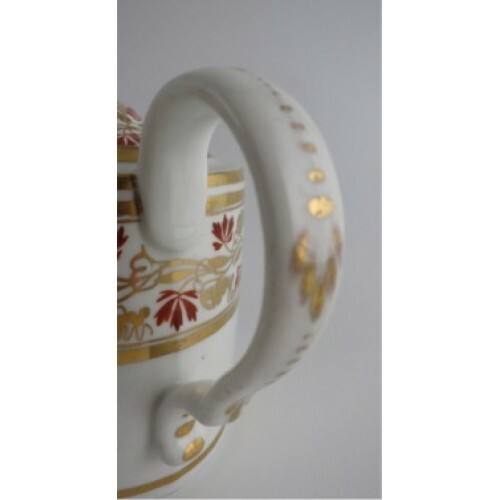 This is a striking Coalport 'Thomas Rose' hand painted smooth oval teapot, decorated in orange and gilt 'grape vine' bands, c1805. 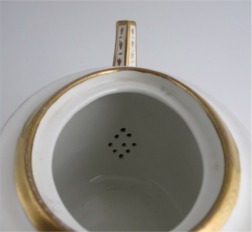 6" (153mm) height of the teapot to the tip of the cover finial. 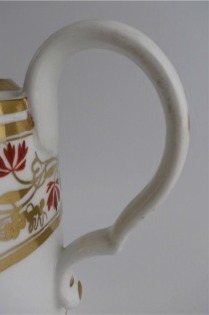 10" (253mm) length of the teapot from the tip of the spout to the back edge of the handle. 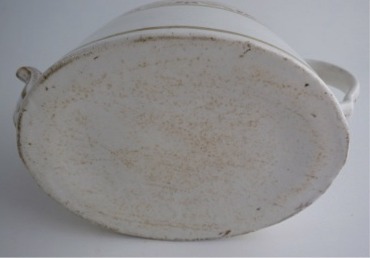 2lb 0oz (905gms) weight of the teapot and cover. 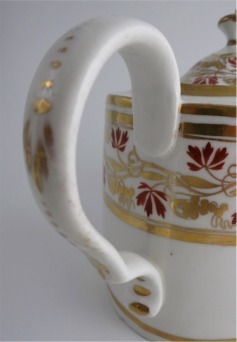 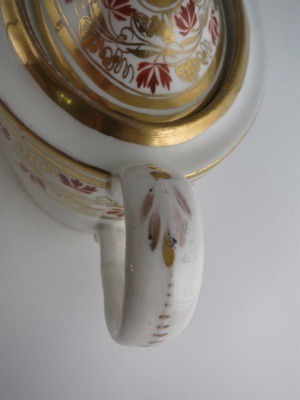 There are no manufacturer's marks on this teapot and cover, but it is from the Coalport factory, c1805. 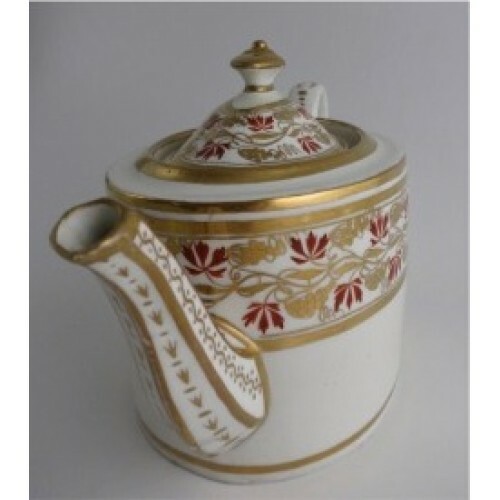 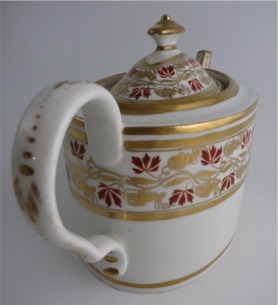 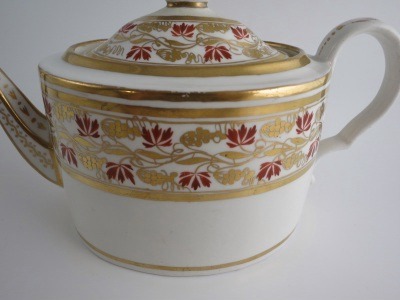 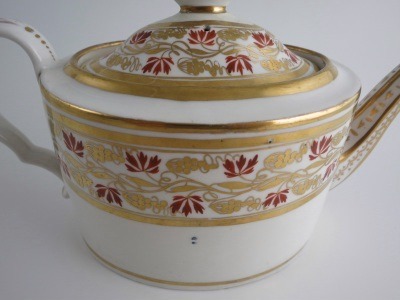 This very fine Coalport teapot is generally good condition with no chips or cracks and the decoration is in very good crisp condition with only minimal wear to the gilding, mainly to the back edge of the handle. 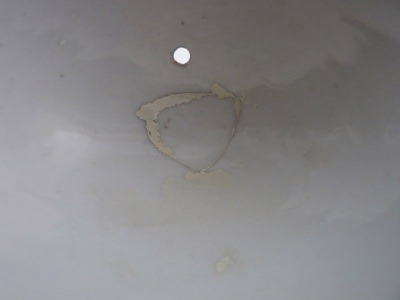 However, the cover finial has been off from the body of the cover and has been restored. 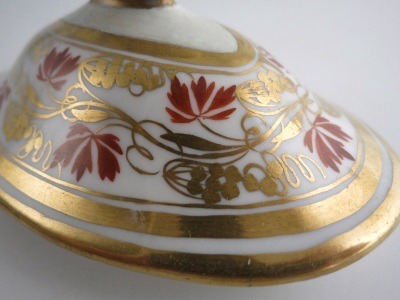 On close inspection the colour of the white paste around the finial to the gilded line before the vine decoration is a creamier colour and on the underside it is clear that the cover finial has been reattached. 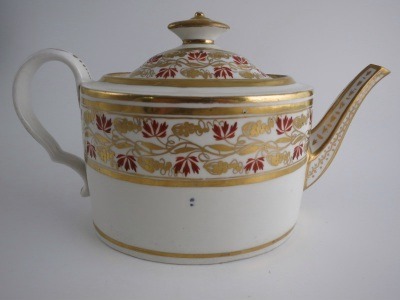 Despite the finial restoration, this is certainly an excellent teapot for the collector of Coalport or early English tea wares. 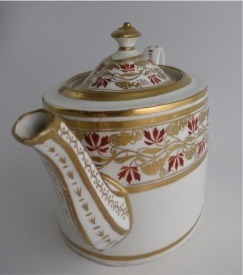 Condition (See main description for full details and pictures) This very fine Coalport teapot is generally good condition with no chips or cracks and the decoration is in very good crisp condition with only minimal wear to the gilding, mainly to the back edge of the handle. 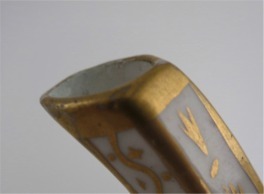 However, the cover finial has been off from the body of the cover and has been restored. 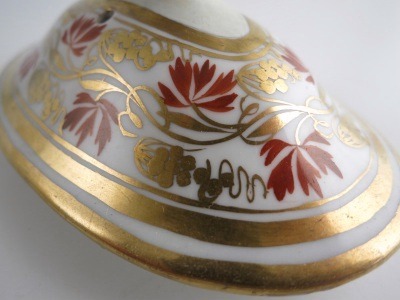 On close inspection the colour of the white paste around the finial to the gilded line before the vine decoration is a creamier colour and on the underside it is clear that the cover finial has been reattached. 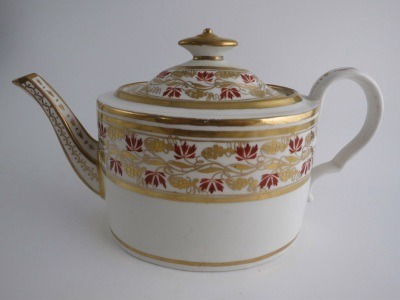 Despite the finial restoration, this is certainly an excellent teapot for the collector of Coalport or early English tea wares.